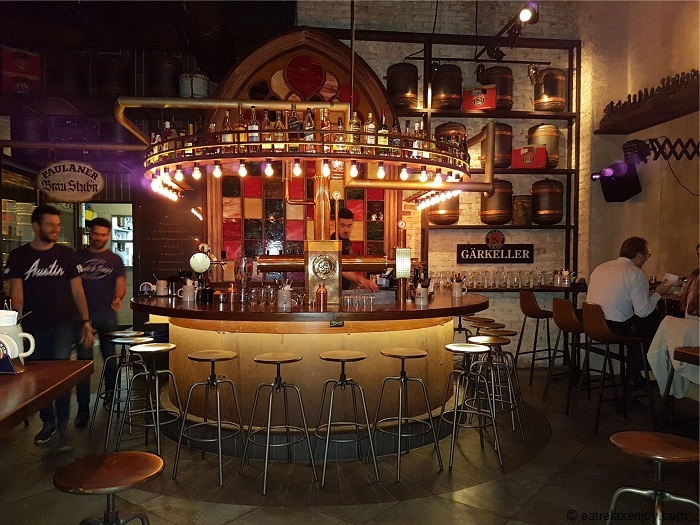 Paulaner Beer Garden opened a new place in Hod Hasharon’s Sharonim mall. 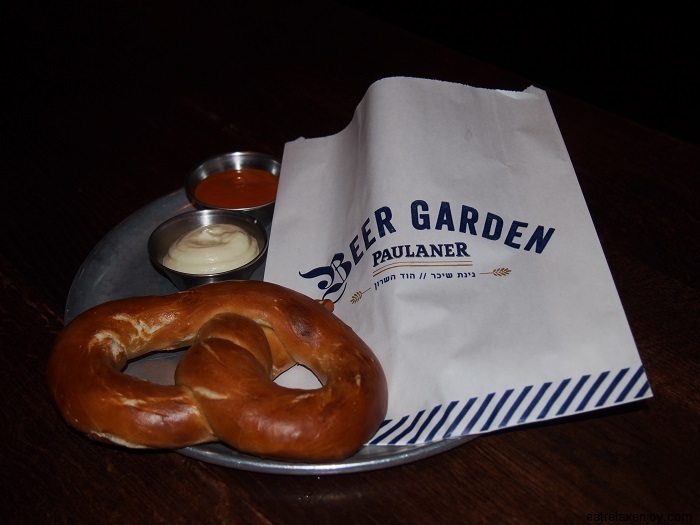 Paulaner Beer Garden exclusively serves Paulaner beers that are especially imported to Israel, including the seasonal Oktoberfest beer. 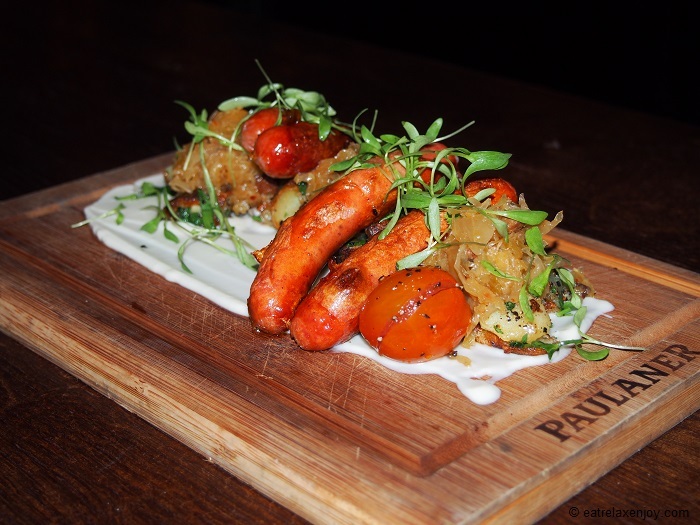 Paulaner Beer Garden is a place for good music and fine food! 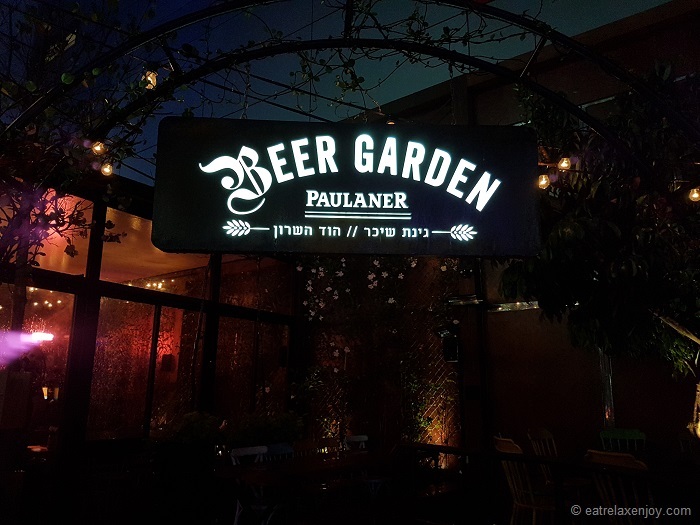 We arrived to Paulaner Beer Garden in Hod Hasharon on a rainy Sunday evening. 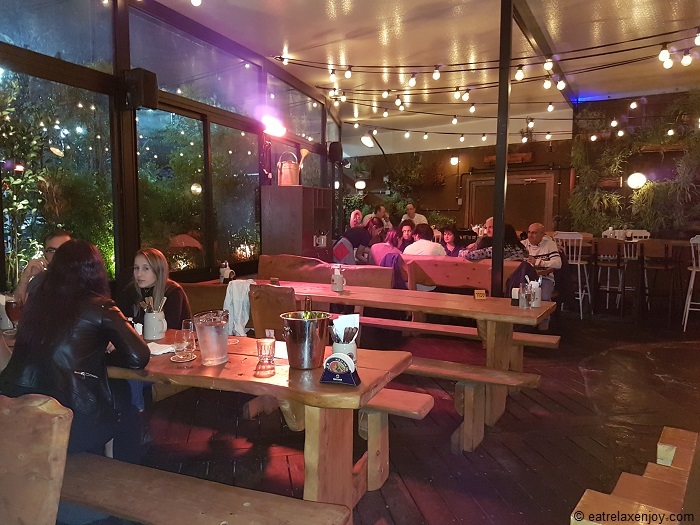 The beer garden has a garden and an indoors area, but both places are covered and heated in the winter. Seating is in long benches. Inside there are more cosy areas for couples. 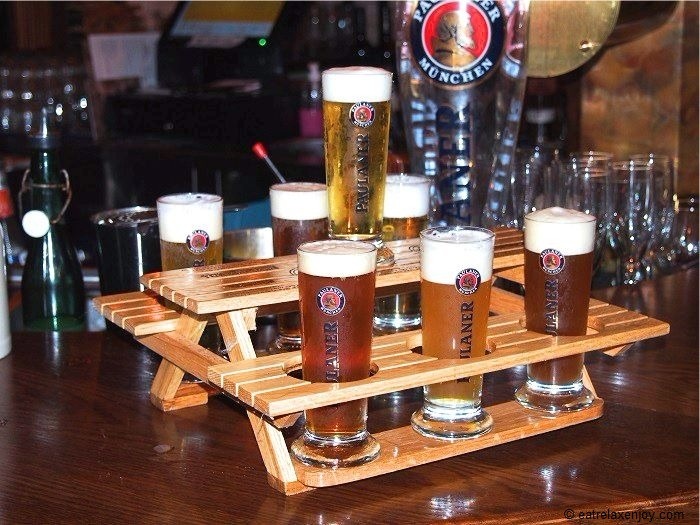 The concept is Bavarian from the 19th century where everyone gathers for happy pastime. 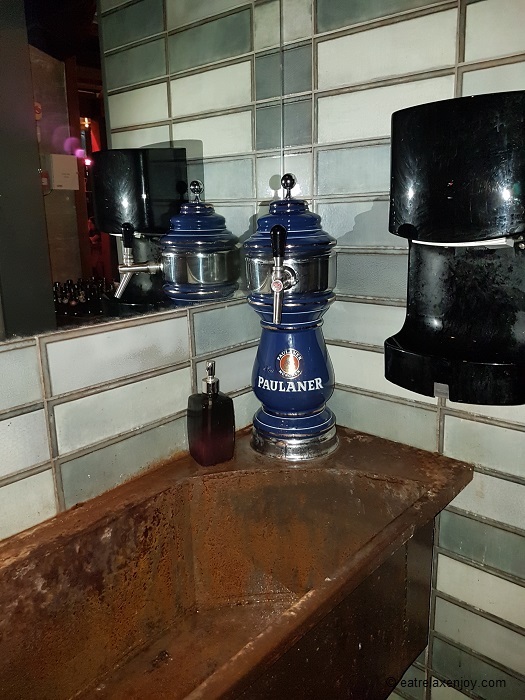 The décor is warm with wood and alcohol bottles, even the tap in the toilets is unique, it looks like a beer tap. There are plenty of beers and alcohol here. The place serves unique Paulaner beers, especially imported to Israel to be served here and they are very good! 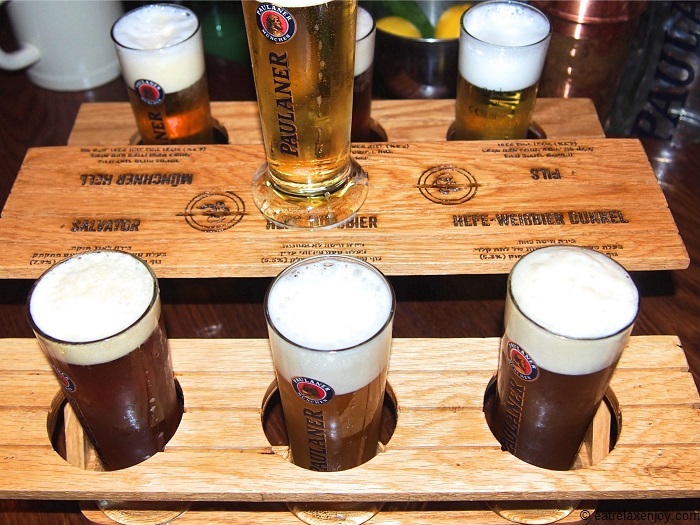 There are at least six types of Paulaner beer plus the Octoberfest during the season. We started with a Royal sampler, which I think is a must have here. I especially enjoyed the Munchner Hell, Hefe-Weissbier, Hefe-Weissbier Dunkel beers and the Oktoberfest, which is only served during the season. 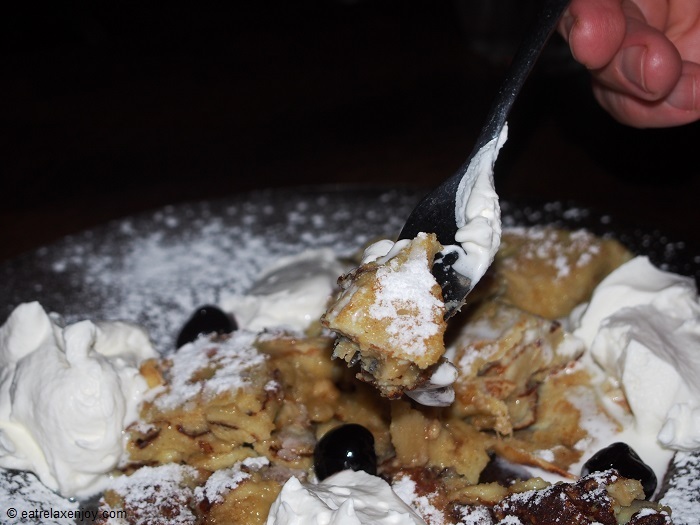 The menu here is Bavarian style, led by Zvika Weiner, including German-Austrian food such as corned beef, traditional sausages with sauerkraut, potatoes, spaetzle, and also standard food like hamburger or salmon. 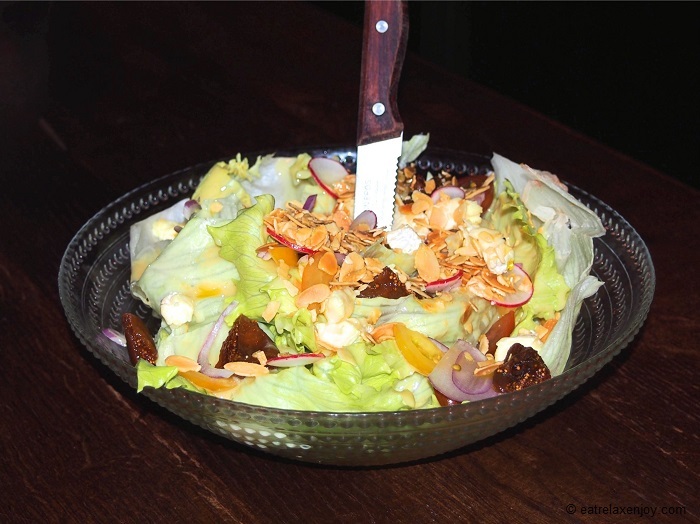 There is variety of food for meet lovers and vegans. Two pretzels with smoked tomato sauce and horseradish aioli. The aioli was a bit spicy and the tomato sauce is really good! 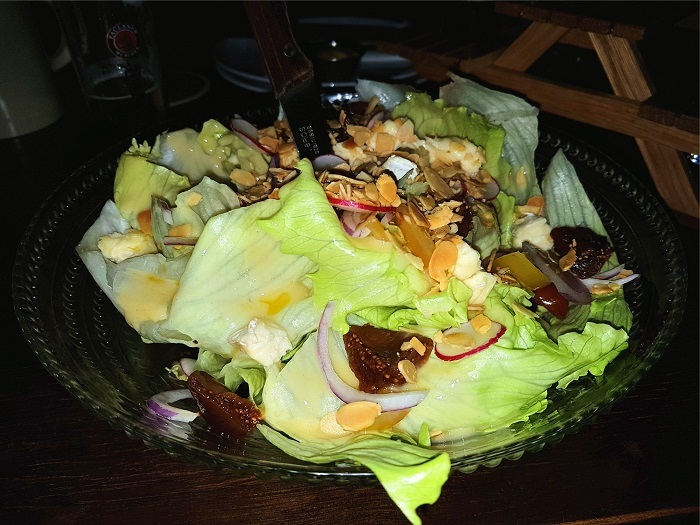 A large bowl of salad with iceberg lettuce, a generous amount of toasted almonds, beer soaked dried figs, brie cheese, with some slices of small radish, cherry tomatoes and purple onion in honey mustard vinaigrette. Good mix of flavors, fresh and crisp. 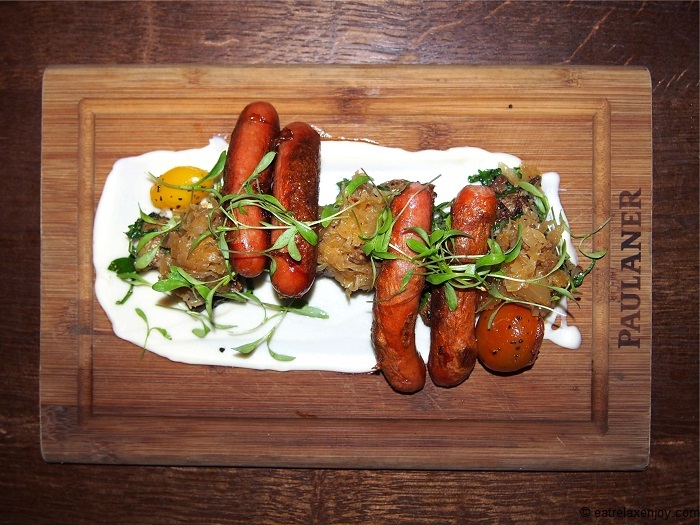 Assorted bite size sausages, bonfire potato, root vegetables cream and choucroute with a twist. This was my husband’s choice and he enjoyed the sausages very much. 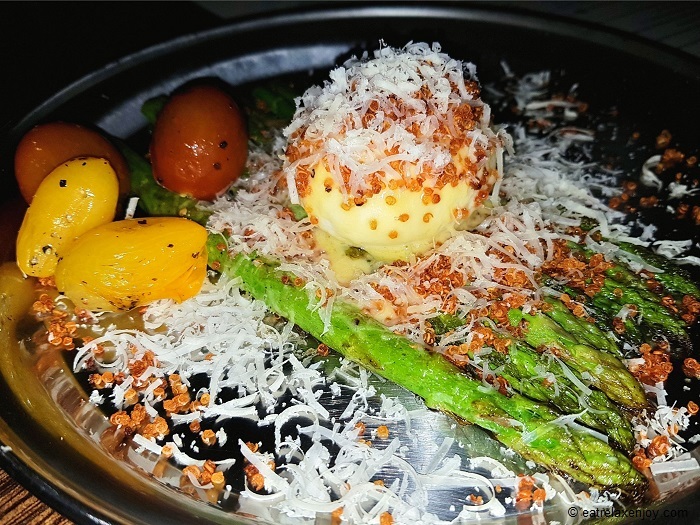 Asparagus with corn cream, semi-hardboiled egg, quinoa popcorn and parmesan flakes. This was my pick and I loved it so much! 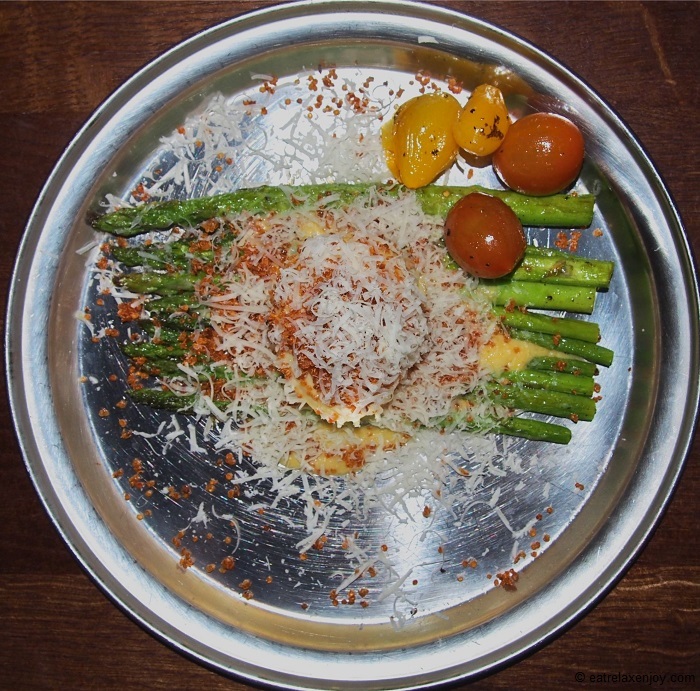 The textures of soft semi-liquid egg and crunchy quinoa were so good! 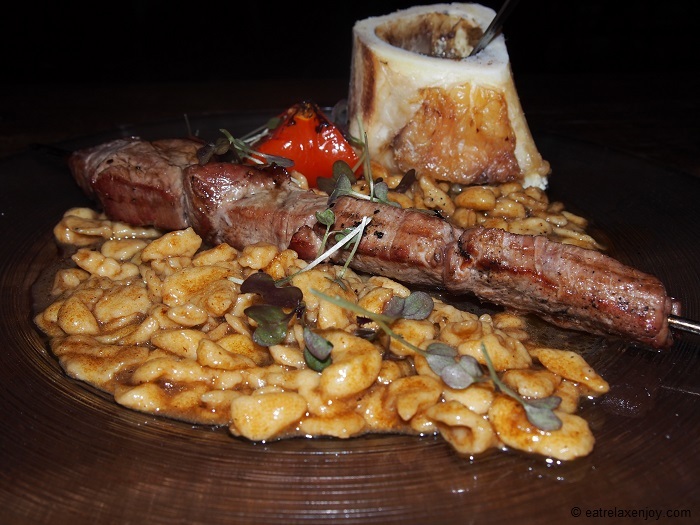 A good portion of beef filet cubes served with spaetzle in meat broth. 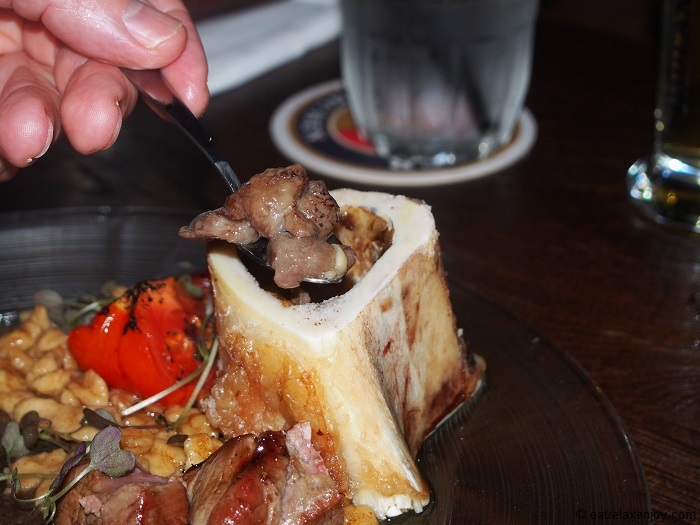 The Meat was soft and the bone marrow a treat! The spaezle is one of the things to order here, it is a type of noodles very popular in Germany and Austria. 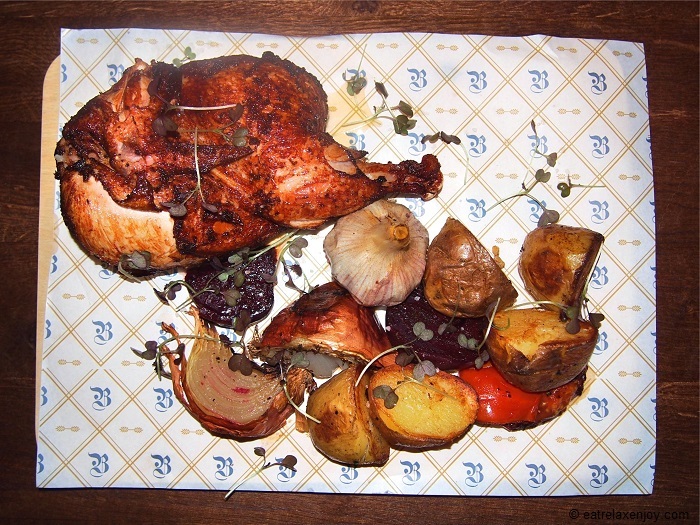 A huge wooden tray with a big grilled half chicken marinated in herbs from our garden, and roasted vegetables. If you don’t share this, plan to pack it home, it is so big. 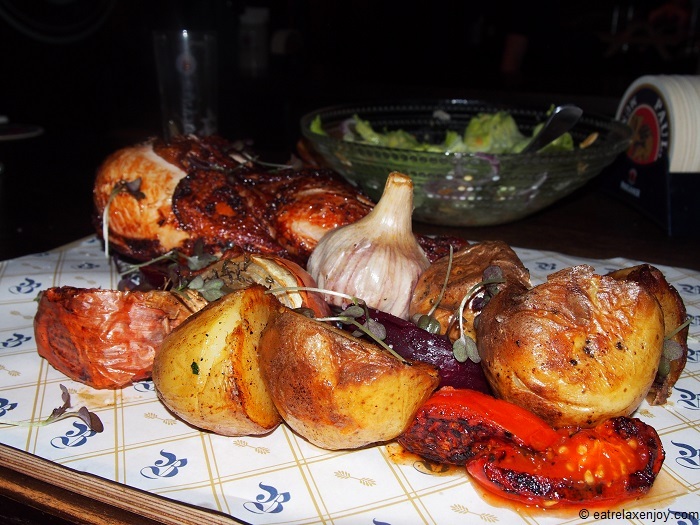 The chicken is tender and well seasoned (somewhat salty in the edges) and the vegetables are very good! 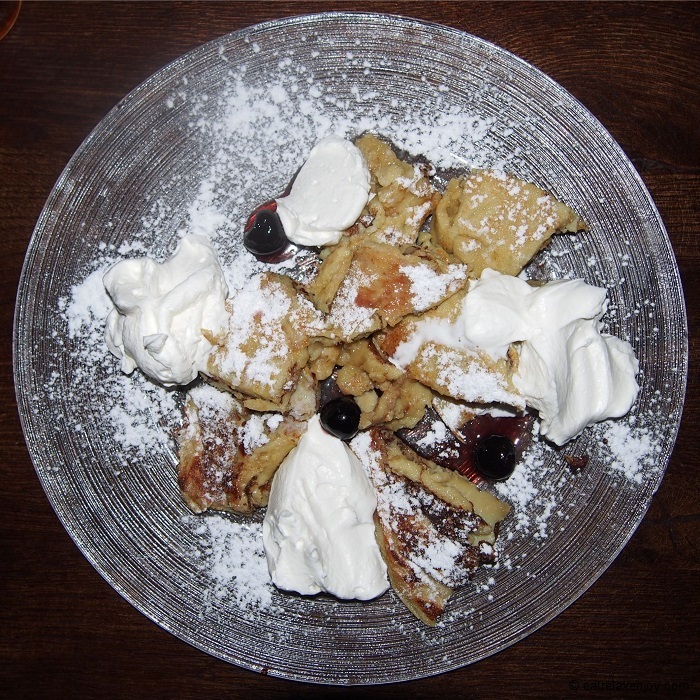 Austrian delicatessen of shredded airy pancakes, powdered sugar, light cream and Amarena cherries. So soft and fluffy, one of the treats to try here, I don’t think that there are many places in Israel that serves it. 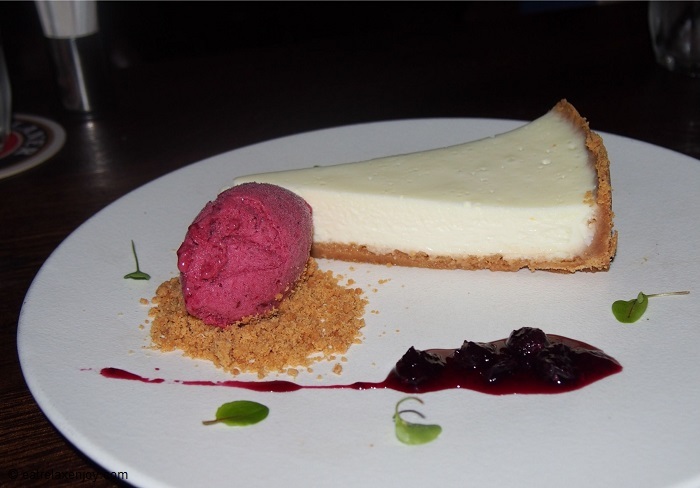 Cheesecake that they made here with homemade berry sauce and blueberry sorbet. The cake is a bit sweet and the homemade sorbet is divine. My husband said that it is worth coming here even only for this cake! Overall, Paulaner Beer Garden is more than a place to drink beer; it is a good place to eat in as the food here is very fine! 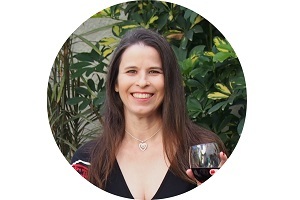 Excellent review ! Thank you.